Above was a photo taken on our wedding day in the Maldives - credit to our photographer for the photo! Little did we know both me and hubby brought each other the same wedding gifts a Daniel Wellington Watch so we both have 2 each with different strap colours. It ended up being a bit of a cheesy his and hers gift! I have the brown strap one and he's got the black strap. For the spare watch I have the pink / navy nato strap named Southampton. 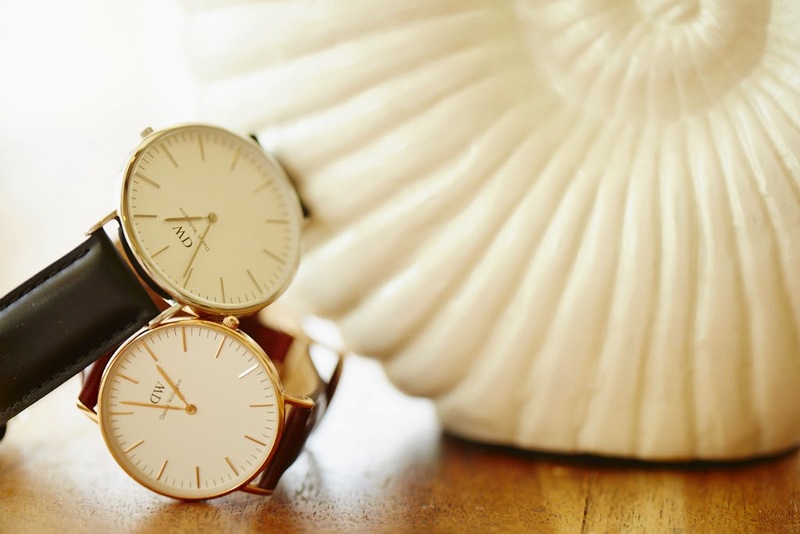 Daniel Wellington watches are incredibly beautiful and timeless, soon as I saw them on Instagram I knew I wanted them straight away. When I ordered for it to be delivered to my work address I had actually hidden the watches in my work draw until my last day at work to keep it a surprise. The straps are changeable so you can change the straps daily if you like, all the strap options especially the nato ones they are just beautiful. To find out more click on the watch you like and it will provide you with all the info! Thanks! I actually thought they would look huge on my tiny wrist but they actually look really good on small wrists! I know right, never get bored of them and one in each colour on the straps so it feels like I am wearing a different watch each day! Thanks for stopping by! The DW watches are definitely on my wishlist. It's classic and timeless and as you've shown, is suitable for both genders perfectly. Thanks Kosta. If you follow their instagram they have so many photos of different people wearing them, so pretty! Thats cute that you both thought of the same gift, great minds! Oh I love these but I have tiny wrists! I am torn between buying one of these and an 'Olivia Burton' watch.